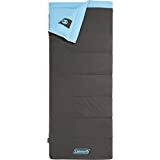 Coleman Heaton Peak Comfort Sleeping Bag – your perfect new camping companion in milder or cooler weather. The Coleman Heaton Peak Comfort sleeping bag is your perfect new camping companion in milder or cooler weather. With its cotton and synthetic material it will keep you cool when it’s warm and warm when it’s cold. The thermo collar helps to keep in the warmth while the comfort cuff beds your head on a soft surface. The Zipper uses ‘Thermlock’ technology to keep additional heat in the bag. If you have two Heaton Peak sleeping bags you can even zip them together for a double sized bag with double comfort.